The Whitby to Loftus line, opened on 3rd December 1883, was a little more than 16 miles in length, from Bog Hall Junction (26 chains from Whitby station) to an end-on connection with the North Eastern Railway at Loftus. 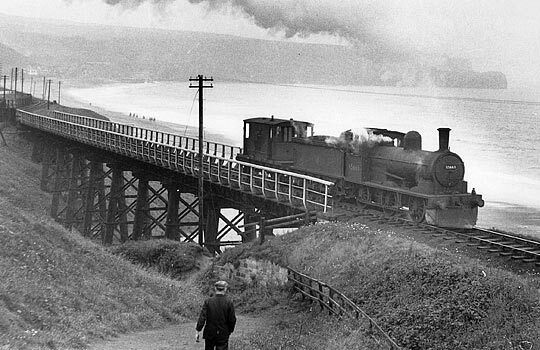 The first proposal, in 1863, for a line along the coast northwards from Whitby was that of the Scarborough, Whitby & Staithes Railway which, in 1864, was rejected by committee in the House of Commons. According to the map, the line between Whitby and Sandsend would have been built a little further inland than was ultimately the case. Between Sandsend and Kettleness the course was more or less similar to that which was eventually built, although the map and the plans give no indication of any tunnelling or, indeed, any cliff-edge work. From Kettleness to Hinderwell the line would have taken a route close to the sea and Runswick village than was eventually constructed. The route on the plan appears to have been rather carelessly drawn, giving little indication of any engineering difficulties (like tunnels and viaducts) that might arise. The Whitby, Redcar & Middlesbrough Union Railway was incorporated on 16th July 1866. 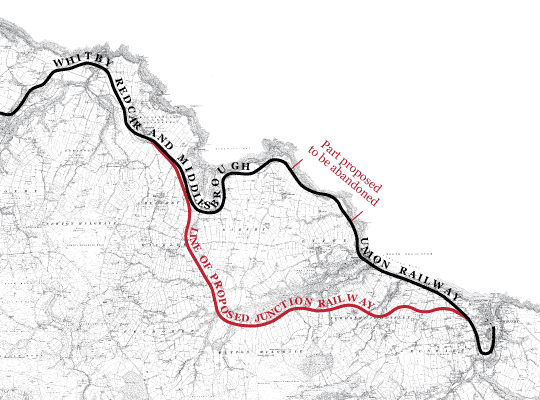 The maps for the proposed line are much the same as those for that earlier and abortive venture in 1864. From Kettleness to Loftus the line is in the same position as it was upon completion in 1883, but (as in the 1864) maps, there is little indication of any tunnelling or bridging between Sandsend and Kettleness (the map ignoring the topographical problems completely), while the line between (the future site of) Whitby West Cliff station and Sandsend ran further inland than the final construction. The estimate for the proposed line gives the total cost as being £235,278 (a vast underestimation as it later turned out) with £66,100 being earmarked for ‘tunnel and viaducts’. It is unfortunate that the two were not separated in the estimate but we know from later costs that tunnelling was far more expensive than the overall costs of the viaducts. The line in its entirety cost £655,077 [c. £32 million] at £40,942 per mile [c. £1.95 million] and very difficult to construct. Although Parliamentary approval for construction of the line was granted in 1866, the first sod was not cut until 25th May 1871, with John Dickson as main contractor. In all likelihood this hiatus was caused primarily by the difficulties the company had in raising sufficient funds. Nevertheless construction of the line was begun, ushering in one of the most dramatic episodes in the history of branch line building in England. The terrain upon which the line had to be built included ravines of post-glacial streams, the valley sides of which were steep and often unsuited to railway construction except with the use of heavy and expensive engineering works. This terrain, and the difficulties involved in bridging it, is clearly shown in the photographs of Staithes viaduct, while operating costs were heavy, owing to the nature of the terrain and the continuing maintenance needed on the three tunnels and five viaducts along the short 16 mile line. The viaducts were manufactured at the Skerne Ironworks, Darlington which enjoyed a chequered career: opened in 1864, it closed in 1875 and re-opened twice, in 1876-79 and 1880-82. The designer of the viaducts was John Dixon (not to be confused, as has happened, with the main contractor John Dickson). These contracts (or ‘articles of agreement’) were made on 1st December 1871 and 25th January 1873. The price for the erection of the five viaducts along the line was £23,452 (well over one million pounds in today’s money). The Engineer of 14th March 1873 reported “We have noted with considerable interest the series of viaducts on the new Whitby, Redcar and Middlesbrough Railway, constructed for the company by Mr John Dixon from his own designs but under the superintendence of Mr J H Tolmé, the engineer. Fortunately, evidence is plentiful for the history of the railway and its viaducts between the years 1871-1889. There are three key sources for the early history of the viaducts with special reference to their cost, the dates of their erection on the line, and the problems they caused before the line could be opened. Arguably the central text is that of the Harrison memorandum which was deeply critical of their design and construction. However, this memorandum was written in 1883, and served to justify the late opening of the line by the NER. The very few historians who have consulted the primary sources accept it at face value; the present historian on the whole agrees with that acceptance. The viaducts were in place very early in the line’s construction. Unfortunately the contract between Dickson and Dixon has not survived; however, it would have been sensible, and not unusual, to bind Dixon to early completion in order to allow Dickson access along the line. The reports of the Engineer, Tolmé, while not always reliable, provide what seems to be a fairly accurate timeline. His report to the Directors of the WR&MUR company on 9th May 1872 (less than a year after the first sod had been cut) informs them that (between Whitby and Sandsend) “The only heavy work on the section consists of three viaducts, the masonry for which is fast approaching completion and the iron superstructure is now in course of delivery.” On 9th September 1872 Tolmé reported “One iron viaduct on this length (the first seven miles from Whitby) is finished, and two other iron viaducts and two short timber ones are in the course of construction”. The timber viaducts mentioned are of interest for they were to be built on what soon became the abandoned stretch of line around the cliffs between Sandsend and Kettleness. 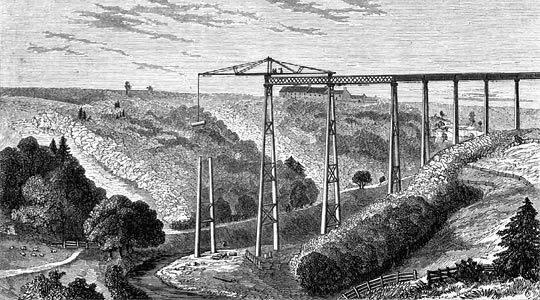 The next five months were productive for, on 21st February 1873, The Engineer reported “The whole of the iron viaducts are now completed, with the exception of the one at Staithes, which is, however, in course of erection.” That this was the case is shown by a most important source, unused by any other historian of the line, which not only gives technical details of the viaducts themselves but includes a vivid and dramatic illustration of Upgang viaduct which, at the time of the publication of the article, can only just have been completed. However, clouds on the horizon were beginning to darken. The Directors’ minutes for 11th July 1873 record that “much discussion took place on the condition and progress of the works and especially with reference to the iron viaducts and the tunnel. The building of the Upgang viaduct was successful for, in his next report of 1st September 1873, the Engineer, J H Tolmé reported that “One of the piers of the Upgang viaduct, over which trains have been running some time, has been recently weighted with double the maximum working load (viz. 180 tons) and had stood the test in the most satisfactory manner, there being no signs of defect or failure in the slightest degree.” Things were not going entirely smoothly elsewhere for, reported Mr Tolmé on the same date “The work at Staithes viaduct has been almost suspended the last few months pending some slight modifications in the designs of the larger spans. These are now settled, and the work will be proceeded with.” Unfortunately, time was running out for Tolmé and Dickson for, according to the original contract, the line was to be completed within two years “by midsummer 1873” and, by September 1873, that time had passed. In December 1873 Dickson was sacked, and by late 1874 the same fate had overtaken Tolmé. There are two likely reasons for this state of affairs: firstly, the poor quality of work produced by Dickson of which the Harrison memorandum provides the most compelling evidence and, secondly, the impoverished state of the company’s finances. That these finances were in a very distressed state is made clear in a very important document: a long letter dated 5th May 1874 from Mr Arthur Hamand who had, from May 1872, become joint Engineer with J H Tolmé. Hamand was clearly unhappy with the company and, indeed, while co-signatory with Tolmé to the half-yearly Engineers’ Report to the shareholders of 31st March 1874 does not appear on such a document again, indicating his resignation or dismissal (neither of which are mentioned in the minutes of the Directors’ meetings). In this letter he is severely critical of the company’s financial situation, making clear that the company’s penny-pinching has considerably exacerbated the problems in completing the line. In order for Dixon to be paid, the Engineer (Tolmé) had to issue a certificate which had the effect, among other things, of authorising payments to contractors. By March 1874 Dixon was becoming impatient for payment and on the 26th wrote to the Board asking for £1,500. He complained that he had had no certificate since the previous July “…why the Engineer should not issue one regularly every month I cannot understand as it is stipulated for in the contract…the work has been going on continuously”. Nothing happened. John Dixon finally lost patience and on 8th May 1874 sent a very tart letter indeed to the Board, demanding that “your engineer be instructed to do his duty”. It was now nearly a year since he (Dixon) had received a certificate although “I have steadily kept on with the works and I think I am entitled to have consideration”. It is apparent, then, from these letters that although the rest of the work on the line had ceased, work on the viaducts was still continuing. This is confirmed by Tolmé’s last report in that he wrote “…the viaducts on the line have been steadily progressing and are now nearly completed.” What is also apparent is that the Board of the company was in some disarray, caused most likely by the lack of funds. By now negotiations with the NER to take over the construction of the line were pending. However, it was not until a year later, after the agreement with the NER, that Dixon’s demands began to be met. The minutes of the Directors’ meeting of 20th July 1875 confirm that “…a cheque for £2,000 be paid him”, while the minutes of the next meeting, held on 27th August, 1875 include the resolution that “…a further £1,000 on account of his contract sum of £3,152 be authorised”. Even so, Dixon was not satisfied. The matter dragged on for a further three years until, in September 1878, the minutes of the Directors’ meeting of the 13th declare that “…Mr Dixon’s claim had been settled for £4,500 of the Company’s stock transferred to him.” By 1889, however, this stock had become almost worthless. Nevertheless the viaducts were completed and, to all intents and purposes, John Dixon had (ultimately) been paid. Before moving to a discussion of the problems presented by the viaducts in the early 1880s, the cost of their construction must be considered. The main source for their cost is the Engineer’s Reports of 1872 and 1873. These reports give (usually at monthly intervals) the amount of moneys spent on various aspects of the line. The costs seem to be cumulative (annually). Thus for 1872 the amount spent on the viaducts was £5,650, while in 1873 the amount spent was £7,500. In today’s money the amount spent on the viaducts in these years is approximately £600,000. These figures are important, for they partly explain why a deviation proposed in 1875 was not taken up. Briefly, this plan was to abandon the section between Sandsend and Kettleness and to construct a deviation inland from Whitby (West Cliff) to Hinderwell. It is possible that it came to nothing because the viaducts would have been rendered redundant and the money spent upon them wasted. There was a pleasing, if stark, simplicity in the design which was immediately apparent to all those who saw the viaducts while they existed. The Engineer remarked that there was no special novelty in the superstructure, where spans of sixty feet had been adopted. 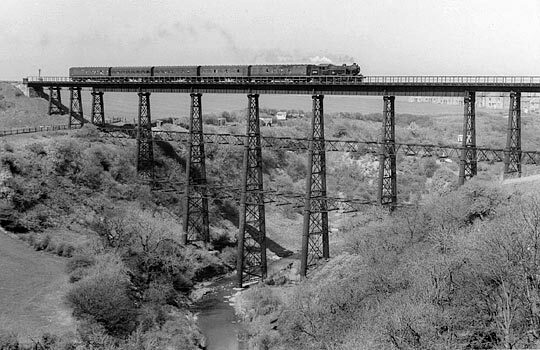 Well-designed lattice girders were thoroughly braced together and these were stiffened laterally by elaborate wind ties were surmounted by cross iron joists which in turn supported a timber platform fourteen feet wide, on which the single line of rails was laid. Because the ravines upon which they were built had at their base shallow streams, there was an equal simplicity in the way in which the foundations of the piers were constructed. The ground was sufficiently solid merely to dig a hole into which the cast iron bed-plate forming the base of the piers was firmly embedded in a mass of concrete. 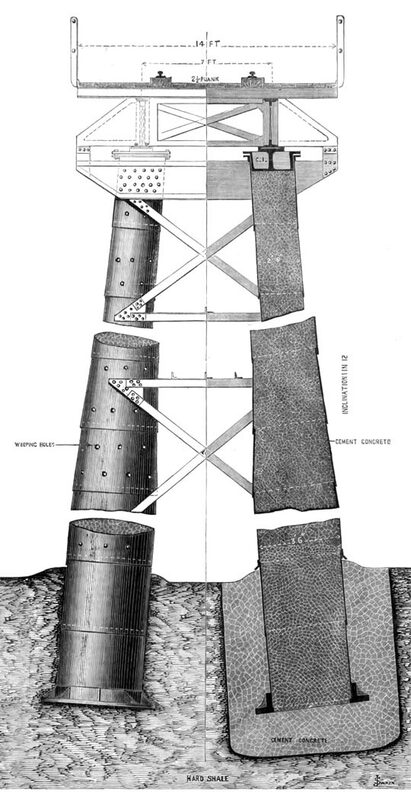 The piers were constructed of wrought iron and The Engineer seemed very approving of Dixon’s idea to fill the piers with cement and concrete, which thus would keep the external skin in shape and dispense with all internal stiffening. “For the sake of concession to popular prejudice more than anything else”, continued the contributor of the article, each pier was equal to a safe load of three hundred tons, more than double that which is theoretically required. Thus the load was not borne by the iron at all “the real duty of which is to hold the concrete column in shape’. The weight of the column therefore was considerable so the diameter was increased towards the bottom by successive offsets from 2’6” to 3’6” and 4’6” which, for ease of construction, is much preferred to a gradually tapering tube. Finally, weeping holes were punched in the plates at every foot to allow drainage of any excess moisture in the setting of the concrete and each pair of columns is stiffened by diagonal and cross bracing attached to the iron skin of the pier at points duly stiffened to receive it. As will shortly be noted, it was not the design that was at fault, but the casual and slack nature of the erection of the viaducts which was to cause so much trouble before the final opening of the line on 3rd December 1883. As has been noted above, the viaducts were in place quite early. An interesting question arises: how were they delivered? Manufactured at Darlington, the various parts of the viaducts could have been delivered either by rail or by sea. Similar viaducts, with larger spans, were commonly manufactured at that time in works like Skerne’s, assembled with temporary bolts at the works, dismantled, sent in smaller pieces to sites and reassembled and riveted at the site. 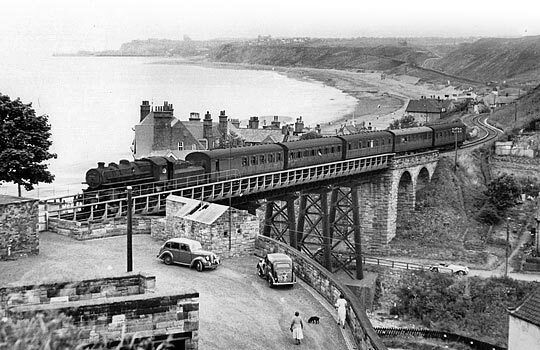 If this is the case, then the parts could have been transported by rail to Whitby and then moved by road to the four viaduct sites between Whitby and Sandsend. It is, of course, possible that component parts of the viaduct were small enough for them to have been sent by sea and offloaded by the following method. 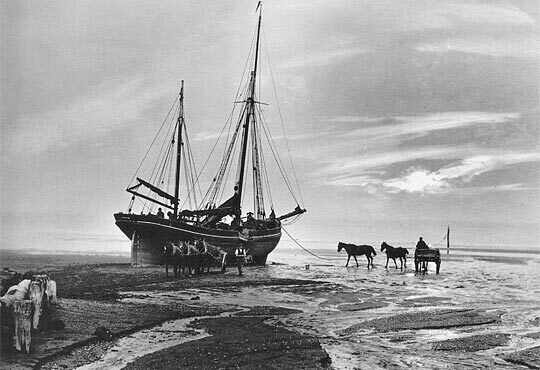 The well-known photographer Frank Meadow Sutcliffe in c.1887 took a picture of a boat unloading heavy material (coal) on to Sandsend beach, from where it was moved to horse and cart. Although the process seems arduous, it may have been the method of transportation for the component parts of the four viaducts, for they all lay very close indeed to the beach where, as seen above, it was possible to ground a boat at low tide. Staithes viaduct, by far the largest of the five, presents a more difficult problem. 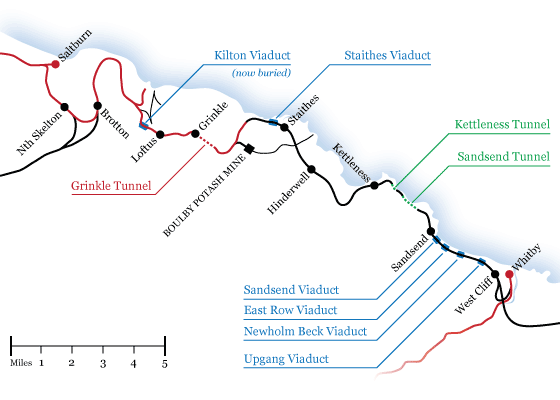 No material could have been transported from Whitby (Sandsend/Deepgrove tunnel not being completed before 1882) and the nearest railhead was at Loftus five miles away; the Staithes-Loftus section of the line was as problematic as the cliff top section between Sandsend and Kettleness and not completed until July 1878. How, then, was the heavy material transported to Staithes? It can only have been by sea. There was - and still is - a small harbour at Staithes where it might have been possible for ships, carrying the heavy structures, depending upon their size, from Teesside to have landed. While quite a haul through the steep, narrow streets of the village it was not far to the site. A unique visual representation of the construction of Staithes viaduct may be found in a contemporary text. The illustration shows the viaduct being constructed from the southern side of the valley. 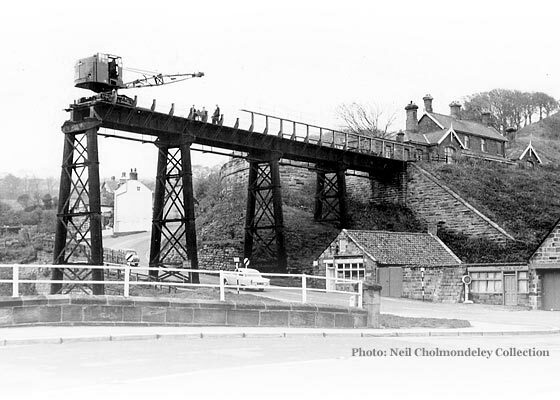 The piece being manoeuvred into position by the crane seems small enough to have been able to be carried by ship to Staithes. Lacking any primary sources on the matter one can only conjecture, but, using the principles of Occam’s Razor, the sea route seems the simplest method of transportation. When this state of the work was discovered it was, understandably, not thought desirable that any formal report should be made by the Government inspector. Next, it was arranged that steps should be taken for a complete examination of every pier in each viaduct with reference to the concrete, and each pier that was out of perpendicular was with great difficulty straightened. No time was lost in remedying these defects and by aid of a force pump machine designed for the purpose liquid cement was forced into every pier. However, at last and two and a half years late, the line was approved by the Railway Inspectorate of the Board of Trade. In the final report, made by of Maj Gen Hutchinson on 3rd November 1883, he gave permission that the line be opened, but it was apparent that he considered that the viaducts still had the capacity to cause problems. On each viaduct the maximum speed allowed was 20mph. Since Major Marindin’s report he found that the concrete in the columns of the viaducts has been carefully gone over, and its defects made good, except in three places in Nos. 5, 6, and 8 piers at Staithes, which were to be at once attended to. He made a number of further demands, firstly that the viaducts be carefully maintained particularly as regards the bracing, both longitudinal and transverse. Secondly, that no time should be lost in painting those portions of wrought iron girders which have not yet been recently painted (this was an ongoing task throughout the line’s history). 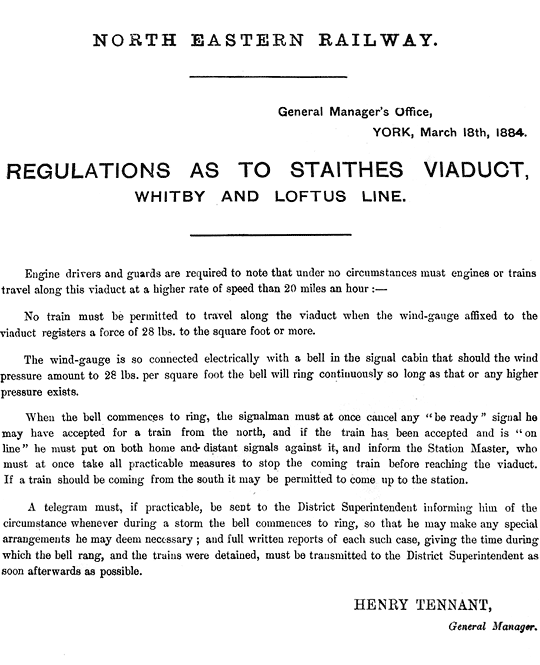 By far the most unusual demand of Maj Gen Hutchinson was that, at Staithes, because of its height and exposure to easterly gales, a wind gauge should be placed in a suitable position, in charge of the Staithes station master, and that no train should be allowed to cross the viaduct when the wind registers a force of 28 lbs to the square foot or more. The line opened, beginning its seventy-five year life quietly. 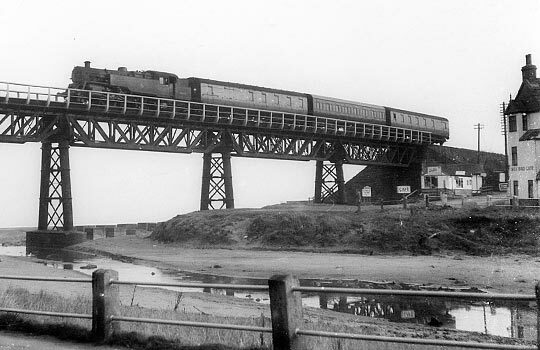 As for the viaducts, they initially gave no problems but, by 1895 (only twelve years after its opening) the lattice girders at Upgang viaduct required strengthening and at East Row viaduct complete replacement (owing to corrosion, the viaduct being built actually on the beach and within 35 feet of the sea at high tide). Certain struts on Upgang viaduct had buckled considerably and needed urgent attention while at East Row it was decided to replace the lattice girders with new steel girders. The contractors were the Cleveland Bridge and Engineering Company of Darlington. The contract for the Upgang viaduct was entered into on 6th December 1893 and the work finished by 30th August 1894; the contract for the East Row viaduct was entered into on 9th May 1895 and the work was finished by 31st October 1895. The cost of the work reflected the seriousness of the nature of the problems: repairs at Upgang cost £714, while those at East Row cost £2,682.14s.9d. The viaducts were regularly painted and maintained and gave no further problems. History is silent concerning the viaducts until the announcement by British Railways in September 1957 that the line would be closed, stating that the main reason for closure was the uneconomic nature of the line and that £57,000 would be required for maintenance of the tunnels and viaducts over the next five years. 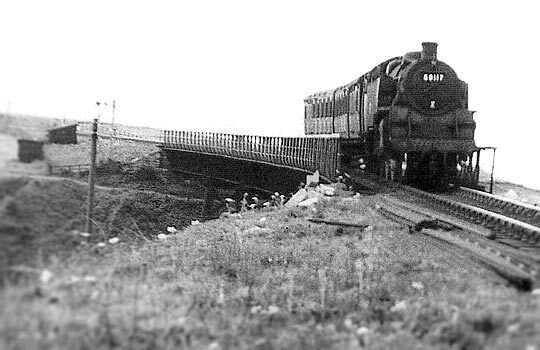 Despite a rearguard action being fought by the Whitby Urban District Council under the leadership of the Clerk, Mr J B McClurg, the line closed to all traffic on 5th May 1958, the last train running on 3rd May 1958. Michael Aufrere Williams, The Whitby - Loftus Line (Staithes, 2012).